We're looking forward to meet you in Landshut again in 2021! We wish to thank you for your participation at our conference and we hope you enjoyed your time in Landshut! 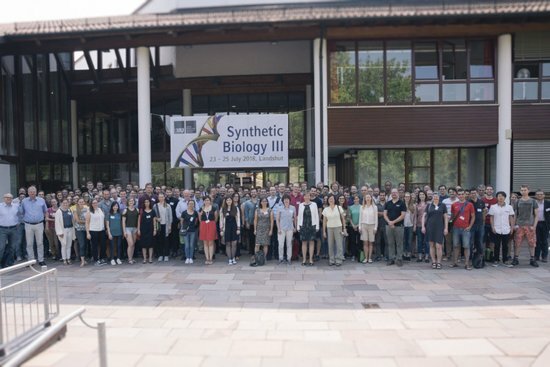 Embedded in the picturesque landscape of Lower Bavaria, the "Synthetic Biology III" Conference took place in the Sparkassenakademie Landshut from 23-25 July 2018, where 160 scientists met to present their results and exchange ideas in the field of Synthetic Biology. The conference covered a wide range of topics. In the first lectures Ned Budisa (TU Berlin), Kathrin Lang (TU Munich), Michael Hecht (Princeton University) and Tobias Erb (MPI Marburg) presented impressive examples on genetic code engineering, the incorporation of unnatural amino acids into proteins, synthetic proteins and synthetic CO2 fixation. Translational aspects of synthetic biology were highlighted by Pamela Silver (Harvard Medical School), Roy Bar-Ziv (Weizmann Institute of Science), Eriko Takano (University of Manchester) and Jerome Bonnet (CBS Montpellier). They discussed the construction of bacterial biosensors, synthetic approaches to promote sustainability, programmable on-chip DNA compartments as "artificial cells," and the optimization of secondary metabolite pathways. In the session “Metabolic Engineering” Dario Leister (LMU Munich), Poul Erik Jensen (University of Copenhagen) and James Murray (Imperial College London) gave new insights into their work on synthetic photosynthesis, photosynthetic electron transport and alternative ways of carbon fixation. Synthetic switches, modeling and computer-based design was the topic of the third session with exciting lectures by Naama Barkai (Weizmann Institute of Science), Erwin Frey (LMU Munich), Joseph Loparo (Harvard Medical School), Chase Broedersz (LMU Munich) and Nikta Fakhri (MIT). Their talks addressed robust biological timers, cellular self-organization, protein patterns and their dynamics as well as the mechanics of living cells. Genome Editing was discussed in interesting lectures by Neil St. John Forbes (University of Massachusetts), Arne Skerra (TU Munich) and Simon Elsässer (Karolinska Institutet). They gave new insights into the development of Salmonella strains for cancer therapy, novel synthetic protein-based therapeutics, and the extension of the genetic code in mammalian cells. Last, but not least, Jörg Stülke (University of Göttingen) gave an impressive lecture on the minimal genome of Bacillus subtilis. The program also included eleven excellent short presentations and 42 poster contributions. The poster prizes were won by Carina Sommer (group A. Skerra) and Kilian Vogele (group F. Simmel). Finally, four invited iGEM teams (Göttingen, Bielefeld, Vilnius and Munich) presented their amazing projects from 2017 and 2018, respectively. In summary, this was a very successful and stimulating conference. The third Conference on Synthetic Biology will take place from July 23 - 25, 2018 at the Sparkassenakademie Landshut (about 40 km away from Munich Airport and 70 km from the Munich City Center). It is one of the largest conferences in this field in Europe. The conference is planned as a platform to exchange and discuss cutting-edge results on Synthetic Biology. This symposium brings together biologists, chemists and physicists working on different aspects in Synthetic Biology. The topics will cover all aspects ranging from mirror biology, orthogonal biosystems, metabolic and genome engineering technologies, synthetic circuits, modeling and computer-aided design as well as translational aspects of Synthetic Biology. 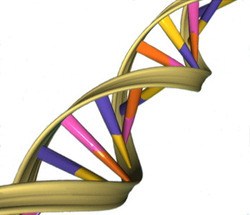 The conference is open to all researchers working in the field of Synthetic Biology.